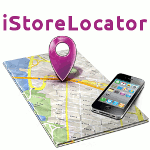 PHP - Ideal Extensions for Joomla! 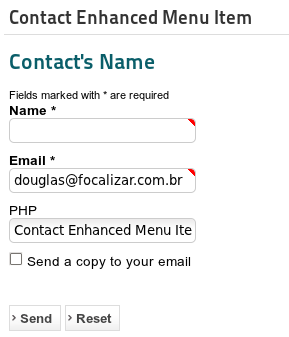 You can add PHP code to a page where a Contact Enhanced form is published. 2. Choose a category for your Form Field, then Save the changes. Joomla 1.6+ comes with a WYSIWYG code editor called CodeMirror. If CodeMirror is enabled Contact Enhanced will load it after the page is saved. PHP Eval Function can be Dangerous if not used carefully. 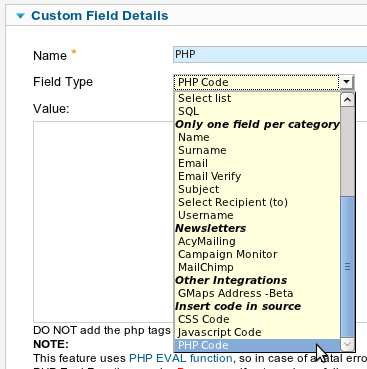 The PHP Form Field has no specific parameters, but you can change the General Parameters. If you choose to add a hidden field, you will probably want to hide the label, if that's the case, go to General Parameters and set "Hide field Label" to Yes. The image on the right is one simple example of how PHP can be used.